The New York Times recently ran a story about Yale University Press practicing self-censorship in publishing a book by Jytte Klausen (due out in November, 2009). Ms. Klausen’s book, The Cartoons that Shook the World, was to include pictures of the twelve Danish cartoons that resulted in rioting and protests in the Middle East in 2006. For reasons detailed in the New York Times story, the cartoons and other representations of the Islam Prophet Mohammed were withdrawn. The Yale University motto beneath its crest is “Lux et Veritas” (Light and Truth). It’s ironic that an organization devoted to academic freedom censors itself. I thought of that in the context of the recent cartoon controversy here in America. A college student from Chicago created a cartoon from an image of President Obama and it became an online sensation. The cartoon of President Obama is the work of Firas Alkhateeb. The cartoon of President Bush is by Drew Friedman and was posted in July of 2008 at vanityfair.com. What’s fascinating about the cartoons is the public’s reaction to them. The cartoon of President Bush was “no big deal,” but when the cartoon of President Obama became public, the reaction was OUTRAGE! The Los Angeles. Times ran a story about the Los Angeles Urban Policy Roundtable. Its president, Earl Ofari Hutchinson, characterized the cartoon as mean-spirited and dangerous. Mr. Hutchinson challenged the responsible party to come forward. 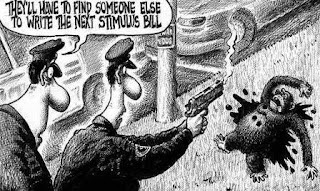 The Orlando Sentinel covered a story about police in Clermont, Florida interviewing a suspect accused of putting up posters of the cartoon. The police were investigating whether any local or federal crimes were committed. The narrative associated with the posters is that these are further examples of racist Republicans doing provocative and inappropriate acts. When it was determined that Mr. Alkhateeb was not a Republican, Mr. Alkhateeb was characterized as a misfit and the story quickly died. A recurring theme in our culture is that a disparaging piece of art about a Republican is to be expected, while the same depiction of a non-Republican is an OUTRAGE! When President Bush was in office, two separate works portrayed his assassination as art. One was the fictional documentary Death of a President that told of the assassination of President Bush on October 19, 2007. Another was Checkpoint: A Novel. If you click on the hotlink and scroll down, you can read reviews of the novel by various newspapers around the country. I like the one from USA Today that describes the work as “a passionate cry from the heart”. This cartoon is by Sean Delonas and appeared in the New York Post. It links a Congressional action with a tragedy in Stamford, Connecticut. The parties involved are not Republicans. What’s the reaction to this cartoon? It’s not anything like the reviews of Checkpoint. Rather, it’s an apology from Rupert Murdoch, Chairman of the New York Post. Dwell on that for a moment: Praise vs. Apology. At some point, academic scholars are going to become interested in the cultural treatment of Republicans in America. The Internet makes it easy to compare and contrast the characterizations, and the information is abundant. Getting back to the issue at the start of this post, I think it’s a pretty good bet that when it comes time to get the anti-Republican culture story into print, the publisher will not be Yale University Press. Yale University Press practices self-censorship.